Camp Idaho: I’m talking with Cindy Sorenson today. She’s the Environmental Recreation Lead for Idaho Power, and we have several different campgrounds to talk about today. How are you doing, Cindy? Cindy Sorenson: Excellent. How are you? CI: I’m having a pretty good day. It’s starting to get cold here in Minnesota, but I’m a pretty active, outdoor person in the winter, so I’m looking forward to that. Not everybody is, but I am. So, let’s talk a little bit about the camping in Hells Canyon. Now, from what I understand, there are several different campgrounds, and maybe you can just kind of walk us through those campgrounds and what the amenities are at each one. Cindy Sorenson: Yes, we have four developed campgrounds in the Hells Canyon Complex. Starting up river, there’s Woodhead Park. And three miles below Woodhead is McCormick Park. Twelve miles downstream of McCormick is Copperfield Park. And seven miles from Copperfield is Hells Canyon Park. CI: Okay, so let’s maybe talk about Woodhead Park a little bit. So, what is the type of camping that’s offered there? Cindy Sorenson: Well, Woodhead is Idaho Power’s largest park in Hells Canyon. It’s located along Brownlee Reservoir, which is 58 miles in length. Woodhead encompasses 65 acres. It has 124 RV sites with electricity, water, picnic tables, and fire rings. There are 15 walk-in tent sites that have also water, picnic tables, and fire rings. There’s large, grassy picnic areas scattered throughout the Park. An RV dump station. A deep draft boat ramp. Overnight truck and trailer boat parking. And there are six comfort stations; are what we call them. And of out of those six, four of those have multiple showers. CI: Okay. So, really outfitted for long-term camping. It sounds like everything is there that you would need. Cindy Sorenson: Yes, there’s a 14-day stay limit. After 14 days, you have to vacate the Park for five days. So, you can go down to another Park and, you know, camp there, and then move back up to your favorite spot if that’s what you want to do. But that’s to make sure that everyone has the opportunity to camp at that particular spot if there happens to be people that have favorites throughout the Canyon. CI: Sure. So, in Woodhead Park, what are the activities that the guests do there? Is there some hiking trails there? Cindy Sorenson: There is actually a paved path that runs all through the Park, all along down through the water. There is an overlook with interpretive information, where you can hike a trail up and back down the other side. You can get plenty of walking/hiking opportunity within the park, and then it’s big rolling hills all around there. CI: Okay, it sounds great. Cindy Sorenson: And people mostly come there to camp, to fish, to boat, and lots of water sports. CI: Okay. Now, how about McCormick Park? What’s the camping like there? Cindy Sorenson: McCormick is beautiful. It sits adjacent to Oxbow Reservoir. Oxbow is 12 miles long, and it’s just incredibly scenic. There are 34 RV sites with electric and water hookups. Some picnic tables. Really nice tent camping area there. Restrooms with showers and flush toilets. CI: Okay, it sounds really nice. Cindy Sorenson: Lots of mature shade trees and big grassy day-use areas. It’s beautiful. CI: Okay. And how about Copperfield Campground? Is everything the same there for RVs, tents, and everybody? Cindy Sorenson: And there’s 62 RV sites, tent sites, the same kind of amenities there, and everything has handicapped accessible restrooms. You know, showers, parking. And it sits right below Oxbow, on the headwaters of Hells Canyon Reservoir, which is 23 miles long in length. CI: All right. And then finally we have Hells Canyon, and is it, once again, a similar setup where you have hookups for RVs as well as tent camping? CI: Okay. So, how far apart are all these campgrounds from each other? Cindy Sorenson: Well, McCormick is three miles down river of Woodhead. Copperfield is 12 miles down river of McCormick. And Hells Canyon is seven miles down river of Copperfield. CI: Okay, so they’re all sort of in the same area. CI: What are some of the more popular activities in and around that area that people should check out if they camp there? Cindy Sorenson: Well, a lot of people come here just for the fishing, because it’s excellent fishing. You know, there’s fishing for lots of smallmouth bass, catfish, crappie, bluegill, and trout – all the reservoirs offer that. 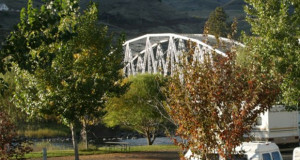 Below Hells Canyon Park, if you go down river about 15 miles, you come to Hells Canyon Dam. 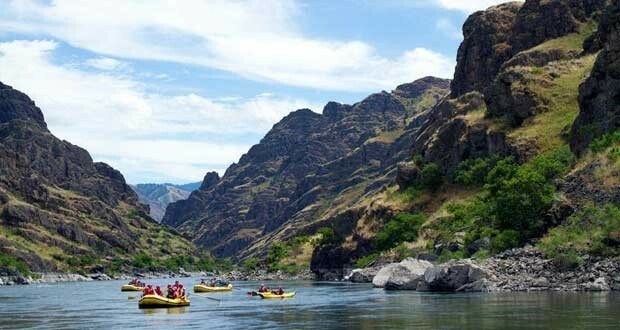 Below Hells Canyon Dam, it’s free-flowing river for about 140 miles. So, there’s lots of jet boating and white water rafting and kayaking for that free-flowing stretch with Class 3 and 4 rapids. Cindy Sorenson: So a lot of people do that. There are creeks. All kinds of creeks and drainages that drop into each one of these reservoirs that offer a lot of upland game and bird hunting. There are higher mountain elevations for big game hunting. Hiking. Lots of hiking opportunities. You can take an old mining road from Hells Canyon Park and, within 15 minutes, be in a heavily wooded forest. It’s really, really scenic. A lot of people travel here Internationally. We get people from Germany and Australia – all over – that come just to see it. It is classified as the deepest gorge in North America. It’s actually deeper than the Grand Canyon, if you go from the peaks of the Seven Devils. Cindy Sorenson: Lots and lots of history here. CI: Okay. Now, you live out in that area. CI: What do you like to do? If you have a day off on the weekend and you’re going to get out for a little bit of an adventure, what’s your first choice? Cindy Sorenson: Hiking. Hiking. Camping. Fishing. CI: Sure. And let’s say you had some people in town. What specific spot would you go to hike with them if you just wanted to blow their mind? Cindy Sorenson: Within Idaho Power Service territory? CI: Yeah. Yeah, anywhere around. Anywhere drivable if I were at the campground. Cindy Sorenson: Hells Canyon Reservoir. Hells Canyon Dam. CI: Cool. Just a few more questions for you. So, we have the four places to camp there, and I’m sure that they’re all awesome spots. If you had to pick one spot to camp at, which one are you staying at? Cindy Sorenson: Hells Canyon Park. CI: You are. How come? Cindy Sorenson: The farther down river in the canyon that you go, the more rugged it becomes. You have higher rocky peaks. It’s just that deep gorge. It’s just beautiful. It’s actually indescribable until you’ve seen it. CI: It sounds like it. Very cool. Okay, awesome. Yeah, that’s great. That’s some excellent kind of insider information that we can pass on to our visitors on the website. Thank you so much, Cindy, for taking some time out of your day to talk with us about Copperfield, Hells Canyons, McCormick, and Woodhead camping. Cindy Sorenson: You’re welcome. And we have an excellent website, where people can actually go get all the information that they need. There’s slideshows. Pictures of the area. There’s the camping fees, camping rules, stay limits, maps, birding brochures – all those kinds of things you can pick up right off our website. CI: Okay, and what’s that web address? Cindy Sorenson: It is www.IdahoPower.com. Cindy Sorenson: And ‘Our Environment’ is the tab that you click on. CI: Okay, we will put a link directly to that within the post, so people can easily get some more information on camping in that area. Cindy Sorenson: So, the more we try and get the information out there, the better it is for everybody. The people that have never seen it are really missing something beautiful. CI: Okay. Well, 50 Campfires is definitely here to help you guys try and get the word out about those areas. Cindy Sorenson: Thank you, Clint. CI: Thank you again for talking to us today. Cindy Sorenson: Sure, not a problem. Call anytime.